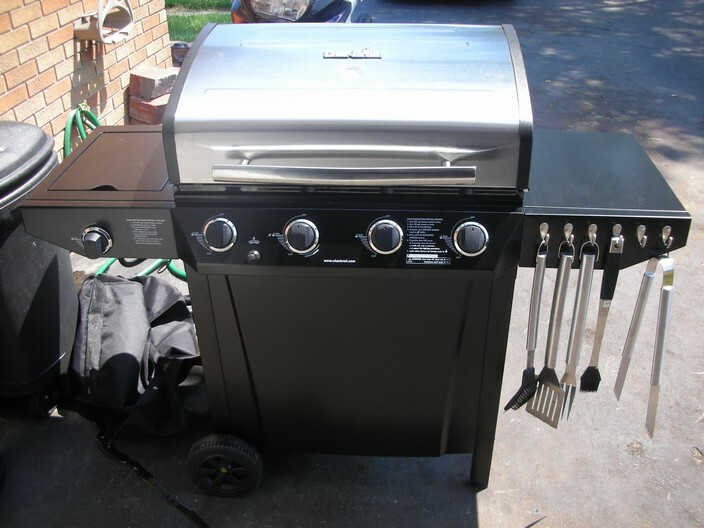 We just purchased a new gas grill, The first one we ever purchased in fact. Believe it or not it was actually my wife who wanted it and it was her birthday gift to herself with the help of some money she received for her birthday, birthdays are great eh? So of course I came along and we checked all the local places like Meijer, Walmart, Home Depot, etc… We decided we really liked 2 different models at home depot. Originally she set a total budget of $300 which had to include accessories and propane. The propane was going to cost a bit more since we needed the tank as well and we wanted a new tank instead of a used one like most places sell / rent. So we found two we really liked but one of them was $250 and the other was $300 which would push us over our budget. The $250 was a Char-Broil 4 burner with a side burner, The $300 grill was a NexGrill which I never heard of and anyone I asked hadn’t either but it was much nicer IMO. The Nexgrill had 4 burners and a side burner like the Char-Broil but it also had a nifty second shelf burner and the front had doors that opened up instead of one solid panel like the Char-Broil. I thought to myself, this would be a cool place to store cooking utensils or utilities as I like to call them. 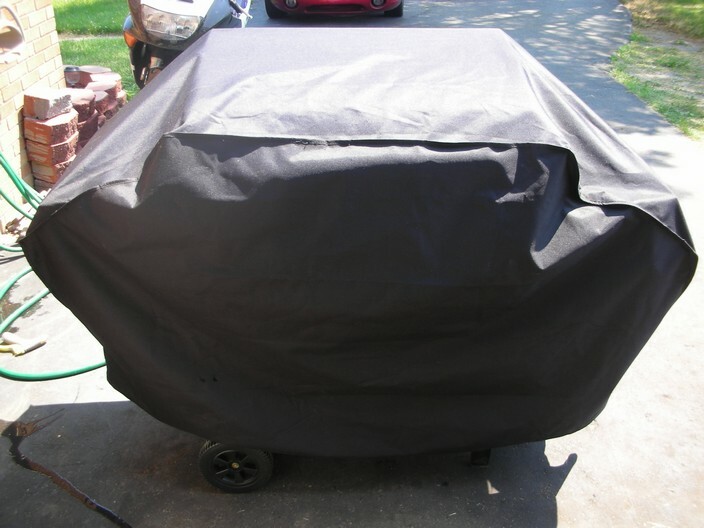 Well I wanted the Nexgrill despite the unknown brand name but my wife wanted the Char-Broil and since it was her gift we *ahem* she decided against the Nexgrill. Sometimes I think it was just because it was her decision and she wanted to flex her immediate and impermanent power but never the less she will be doing more grilling than I will due to the fact she cooks more than I do so great choice and bravo. 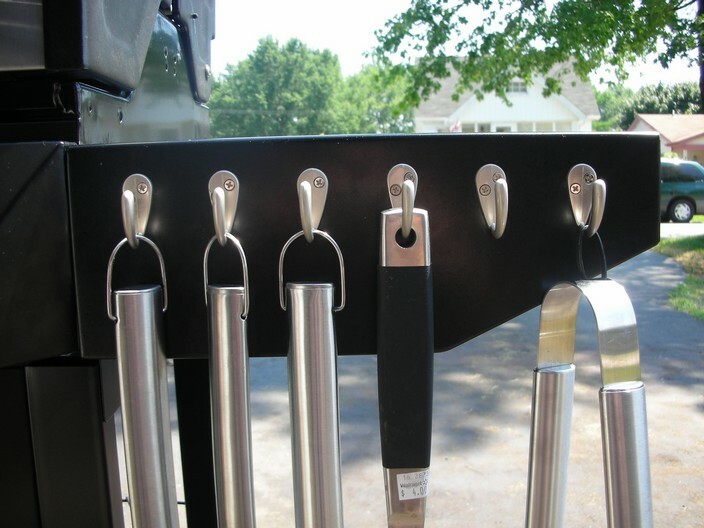 Now lets get into the nitty gritty of the article here and touch on the grounds for the modification to the grill. One the first things my wife bought was a grilling “kit” as they call them which consists of standard things like a “burger flipper”, “scrubber”, “food grabbers” and so on (wrote in my wifes terminology). Now the issue comes when trying to store these things. They are too large to store in any drawers in the house and the garage is too messy to just leave them lying around nor do I want them constantly in my way while I am working on stuff out there. So here is my simple solution involving some easy to obtain items and a tiny bit of spare time. First you need to purchase some hooks, I prefer hooks that use screws for mounting over sticky tape. I was afraid the sticky tape would melt or just peel off over time from being out in the weather. I found some nice little hooks at Meijer but Home Depot would likely have been the better place to get these. I spaced out the hooks and measured the spacing to keep everything even and stock looking then used a smaller than the screw drill bit followed up by mounting the hooks. All pretty standard stuff but I feel like I needed to lay it all out since there was a lot of fluff leading up to it. So without further delay here are the picture of the finished product.